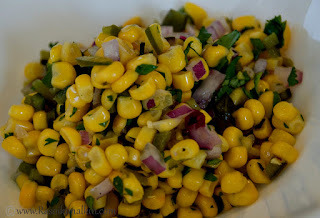 Corn salsa,is a combo we use for burrito bowl.This one can also be prepared and made yummy by adding finely chopped tomatoes ,giving it a tangy touch.However we can make it mild or spicy . Combine all the materials in a bowl,and refrigerate it for 2 hrs,remove an hour before serving..
yum yum looks very tempting and lovely. Salsa looks so delicious and nutritious. So light n fresh yet full of flavors ~ love it!